Many choices in stainless steel and cotton reusable brewers and infusers. 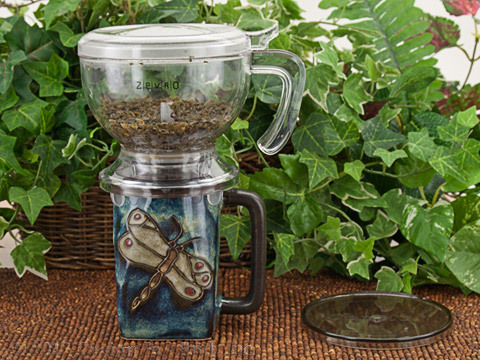 Incredabrew flow through coffee and tea makers for one mug at a time. 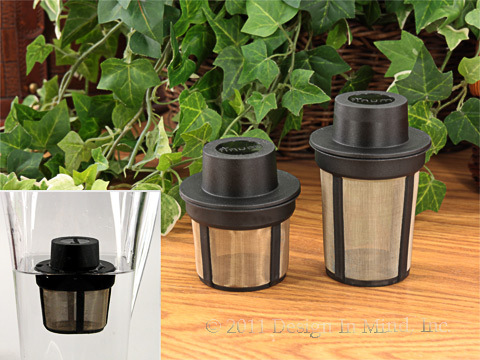 Finum fine mesh reusable filters for mugs and teapots. 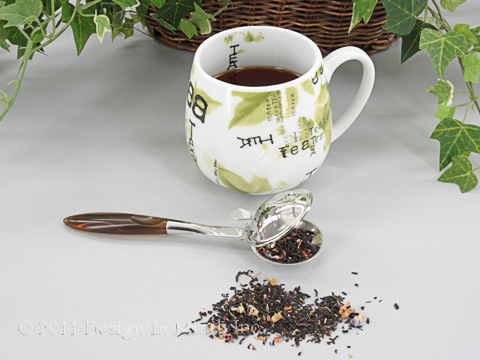 A variety of stainless steel designs for mugs and small teapots. Cotton tea socks are washable. Direct infusion tea maker for up to 20 ounces of fresh tea. Add loose tea or teabags and hot water, then brew as directed. When ready place the unit on top of your cup or mug. The tea automatically fills the cup. Lift the unit to stop the flow. Made in Taiwan with BPA free Tritan plastic. Removable filter for easy clean up. Top rack dishwasher safe, but hand washing is recommended to preserve the finish. NEW!! Works great! 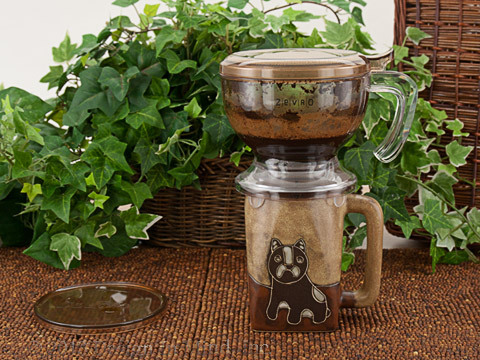 Direct infusion coffee maker for up to 20 ounces of fresh coffee. Add ground coffee and hot water, then brew to taste. When ready place the unit on top of your cup or mug. The coffee automatically fills the cup. Lift the unit to stop the flow. Made in Taiwan with BPA free Tritan plastic. Removable DOUBLE filter for easy clean up. Top rack dishwasher safe, but hand washing is recommended to preserve the finish and flavor. 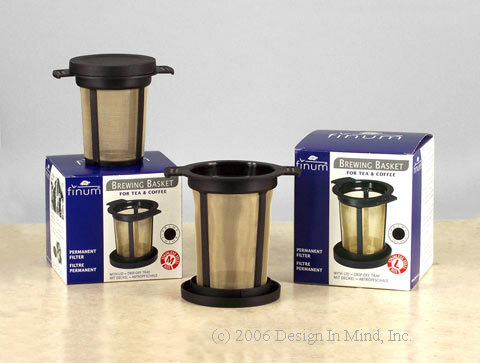 Finum permanent tea filters feature a very fine stainless steel mesh with a permanent goldtone finish produced by processing the stainless steel at very high temperatures. This finish helps minimize interaction with the tea. 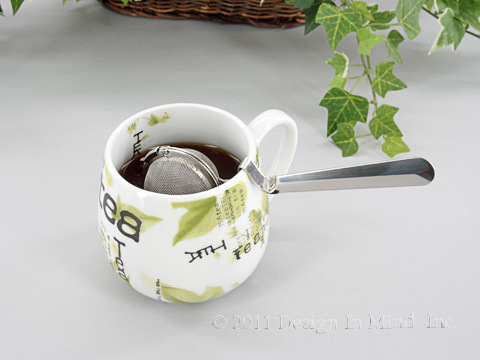 These are perfect for small or large mugs and teapots with a round opening. Medium: overall height, 3.25"; rim diameter minus handles, 2.5". Large: overall height, 4"; rim diameter minus handles, 2.75". Stainless steel infuser with brown handle. 6.5" long, 2" diameter. Good for single serving cups. Scoop, Close And Brew. Ideal for spices, too. Stainless steel infuser with handle. 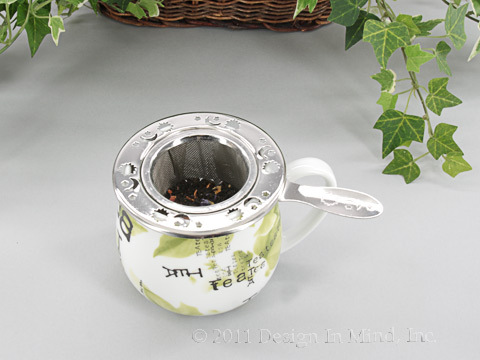 Fits cup and teapot openings from 2.25" to 3.75" wide. 2" deep infuser. 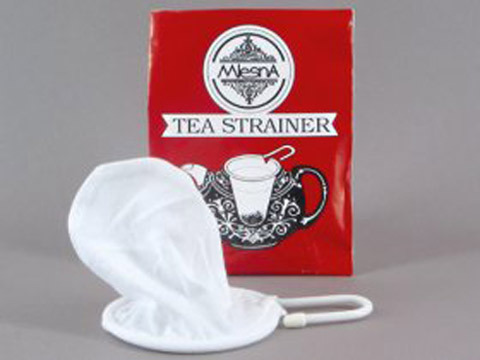 Stainless steel 2 inch mesh infuser with cup handle rest. Rest infuser on cup when tea has steeped to desired strength. Finum floating tea baskets. Available in two sizes. Fine mesh infuser. Medium size recommended for mugs. Minimum opening required is 2 3/4". 2 5/8"D x 3"H.
Large size recommended for teapots. Minimum opening required is 2 3/4". 2 5/8"D x 4"H.
Also recommended for mulling spices or bouquet garni. Cap doubles as a tidy. Dishwasher safe. Made in Germany. 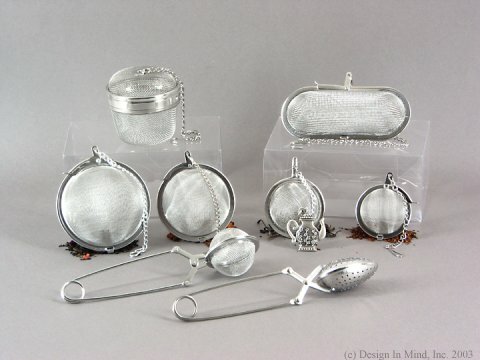 Stainless mesh infusers in a variety of shapes and sizes. Round infusers with chain in 1.5, 2, 2.5, and 3 inch diameters. The 2 inch ball includes a pewter teapot ornament on the chain. Larger basket and oval shapes are for big teapots. The spring handled ball or spoon are for single serving use. 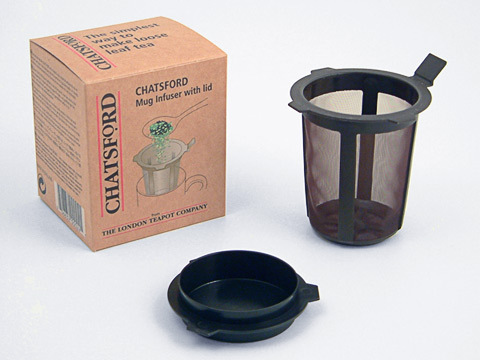 The same infuser used in Chatsford Teapots is available for use in most common mug sizes. Fine nylon mesh works well for both whole leaf and finely cut teas. Lid doubles as a drip tray. 3"H x 2.5"D.
Reuseable (and washable) cotton tea sock with an expandable 4 inch ring to clamp outside the rim of the teapot. Holds enough tea for the largest teapots. 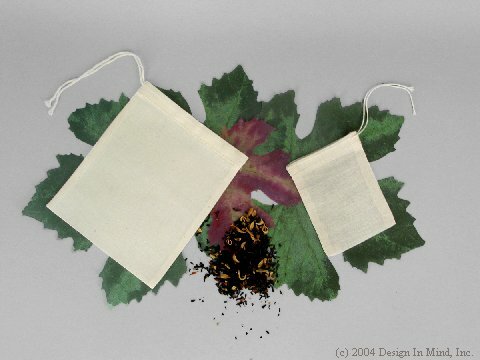 Designed for use as bouquet garni, these reuseable cotton bags can be used for infusing tea as well. Small bag is 2.5 x 3.5 inches and will infuse up to a 3 cup pot. Large bag is 5 x 6 inches and will infuse a 6 to 8 cup pot. How do I choose a tea infuser? How do I check my order online?